Please contact the owner directly @ 630-479-9182 or catpat2(at)aol(dot)com.Retiring and moving south and would like to find our boat a new home! She handles great and has a 13 foot beam with twin 350 Mercs. (about 1000 hours) She also has 2 60 gallon gas tanks with upper and lower helms. Engine maintenance is a snap as she has floors that open wide to both engines as seen in the last two pictures. 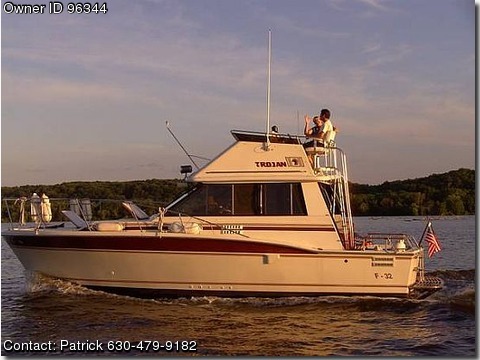 Also included are: 2 ship to shore radios 2 GPS Depth finder 1 radio/cd player refrigerator stove/oven new hot water heater A/C, Heat unit 4 years old Full fly bridge enclosure like new, 3 years old Full sliding glass door entrance with screen door 3 large hatches with screens. (V-berth, above dinette and bathroom) IKEA couch that folds out to a bed V berth bed has 3 inch foam on top of cushions. (not sure but could be 4 inch?) We would consider offers?